Mothers Day is the 2nd busiest holiday for florists and as you guessed we had a few fabulous parties on top of all the daily orders. It's so nice to see all the ways people honor their Mom's. 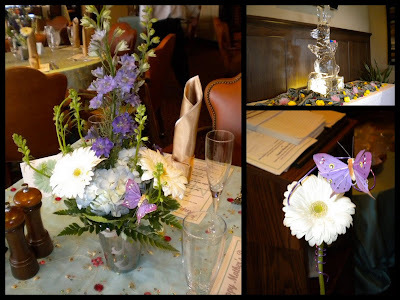 Above are some the the arrangements we did for the Mother's Day Dinner at The Carlton Woods in soft lavenders and white. I also included a very fun picture from easter that I found of the ice sculpture (i thought it was too cool to leave out!). Each Mom received a white gerbera daisy with a beautiful butterfly to take home.